Peter Darrow is a millennial, a native New Yorker, an entrepreneur, and an expert at learning from his mistakes. He earned a bachelor’s degree in psychology and philosophy from the University of Miami in South Florida. After college, Peter earned an MBA in entrepreneurship from Babson College in 2014. The following year, in honor of his Dad, he founded Darrow’s Farm Fresh in Union Square, a farm-to-table restaurant that focused on healthy and fresh dishes, juices on tap, and smoothies. While in operation, Darrow’s Farm Fresh received positive press including articles in Well and Good, AM New York, Sideways NYC, and Total Food Service. He recently founded a new company, Veggie Dust, the first ever vegetable seasoning for kids. A health and wellness entrepreneur with a passion for helping people, Peter wants to encourage others to break free from limiting beliefs and outdated values so that together his generation can create a happier, healthier, more beneficial society. Millennials live in a rapidly changing world, a world of complex markets, tech disruptions, uncertainty and great abundance. This has led to a dramatic shift in our lifestyles, our needs and how we go about fulfilling them. There is great confusion about everything; dating, relationships, professional life, health, finances, social life, career paths, entrepreneurship and, more worryingly, attaining security or happiness. Peter Noble Darrow recognizes this and in his book Wise Millennial he offers advice that is meant to equip millennials (and Gen Z'ers too) with adaptiveness. It includes insights and observations that bring clarity and confidence. I have never met Peter Noble Darrow, but after reading this book I can say I know him (almost). His personality leaps off the pages. Clever, fun, sprightly, charming, gregarious, humble, kind, loving and sensitive, he is there to wrap you in his positive spirit. He’ll entertain you with his funny stories, intrigue you with his tales of novel experiences, move you to tears with his accounts of great loss and humble you with his reflections. You want his company, you ache for that connection, because for some ineffable reason it is fun, enjoyable, and a bit cheesy, but as edifying as it is gratifying. Here you rest, here you lose yourself, not in a mystical sense, but in the way you lose yourself when you step back and examine your life. Like those brief moments when you see your life so clearly, without being caught up in the emotion of it all, with such supernal clarity that you make the best decisions. This is what this book offers; a moment of supernal, preternatural clarity. 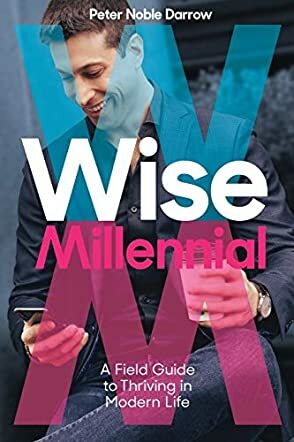 Nothing about Wise Millennial feels pretentious, unrealistic or grossly out of touch with the reality of most millennials; it is this universal appeal which makes it even more rewarding to read. The fact that the author is so human means Wise Millennial reads mostly like a memoir, or like a late night honest conversation with a friend over beers. It's a joy to read and very memorable. I highly recommend it. Wise Millennial is enrapturing, edifying and transporting.